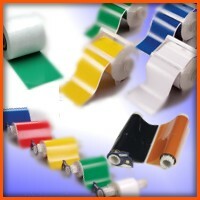 A common search term for Brady GlobalMark printing ink is "GlobalMark Ink", though these supplies are actually known as "GlobalMark Ribbons", or thermal transfer ribbons. GlobalMark ink is formulated for the GlobalMark printer, and works only with GlobalMark vinyl. GlobalMark ink ribbons come on an easy-to-load cartridge, and are available in several colors. The hardware in the GlobalMark printer and in the GlobalMark ink cartridges allow the printer to operate only when loaded with a Brady or compatible ink. These are some sample catalog numbers for commonly used Brady GlobalMark ink ribbons. These are just a few examples of the ink ribbon supplies that are available for the Brady GlobalMark label printer.